I will ask Bernard Wolfsdorf if he can get those numbers from Charlie Oppenheim. For whatever reason, India wasn’t on the NVC slide in the presentation for IIUSA. Thank you so much Suzanne. I will wait to see your comment with India numbers in this thread/post. Thank you for the update. With a 9/30/2016 EB-5 India priority date, in your opinion, what is the realistic time frame for I-526 approval? Fairly disappointed that backlog keeps increasing with each month. Thank you. In theory, I-526 is first-in-first-out by date, regardless of country or other factors. So being from India should not help or hurt your time for I-526. Because IPO promised to prioritize processing times in 2018, and receipt volumes have fallen since 9/2016, I guess that you’ll see less than the current 21-month timeframe. Thanks again Suzanne for the excellent write-up and prediction calculations. Do we know why the petition count for FY2017 is so low compared to FY2016? Only 126 + 2 + 0 + 14 + 6 = 148 applicants from those counties in the entire year? Thanks Suzanne. As always you’ve summarized the situation eloquently. Hi Suzanne, thanks for the update, which many of us were waiting to hear from you. 40% longer queue for I-526 will definitely hurt all pending applications (and as a consequence, I guess all future applications as well?). Any feedback on the likely effective date for the new enactment? There were some discussions previously of 1 year grace period for the new quotas to be effective. The term sheet says “Phase In: 4 month moratorium after DOE on the filing of I- 526s and I-924s.” and, for non R/UD investments: “In months 5-12 after DOE, up to 7,000 investors and their derivative spouses and children can be approved for visas at an investment level of $925,000.” But I’m just looking at one page of sketchy notes, not legislation. I understand that this page represents an offer from Senator Grassley’s office, not a final deal. I don’t know how long it could take for a bill to be written up and get a chance for inclusion in passable legislation, but trust that the public would get a chance to preview and react to the actual bill text. Hello Suzanne thanks for the information. 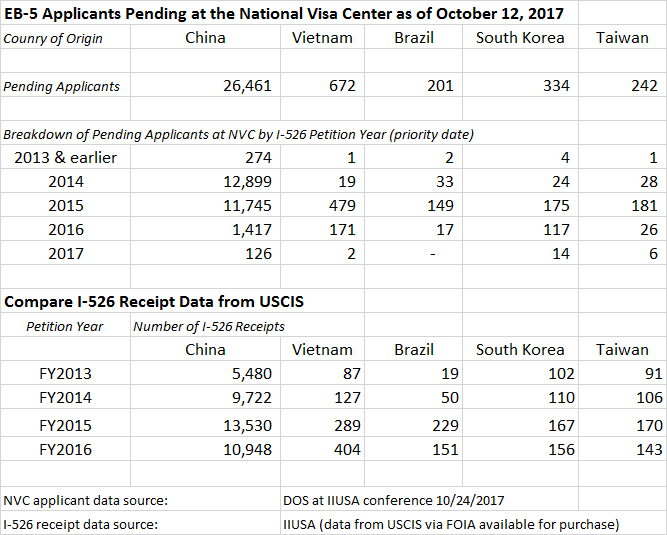 I am still trying to understand the sheet in order to have a prediction on how long it is going to take to have the i-526 approved for applicants from non-chinese (actually Brazilian) on April-17. Any guess? thank you. Yes, a lot of processing news. I’ll put up a post as soon as possible. Suzanne, Is it still possible to apply for Viet Nam? I have a client requesting information. Is processing longer or shorter for Viet Nam? Thank you. It is still possible to apply for Vietnam. 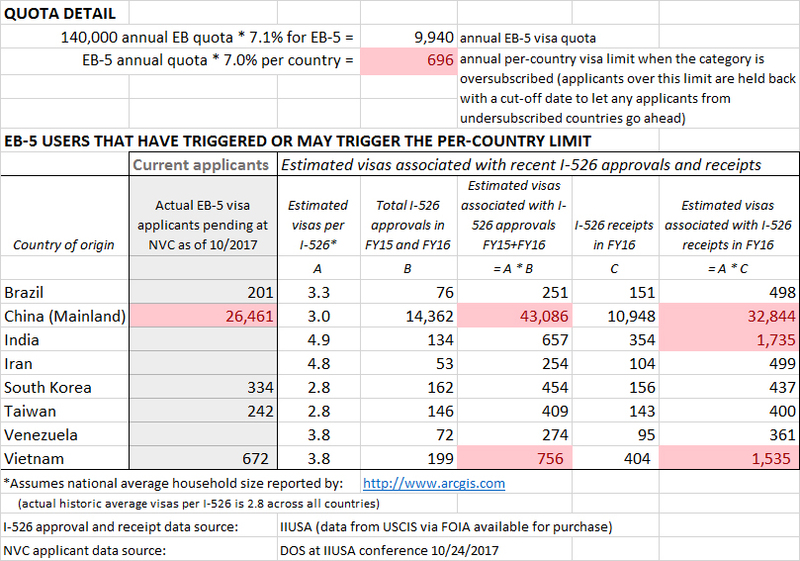 There is currently no country-specific difference in I-526 processing time — the I-526 process is basically first-in-first-out regardless of nationality. Since a Vietnam cut-off date is predicted for next year, the client might experience a delay at the visa application stage, but probably not a long one. Thanks for this comment, I was about to ask the same question. Wonderful, thank you. There is so little information about I829 processing times. I829 processing times seem to be getting longer and longer. I’m assuming that as times goes on, and if nothing changes wait times will get longer. Theoreticaly speaking lets say for whatever reason a person with a condition green card has not had his/her i829 approves due to long wait times for 3 years after their conditional green card was supposed to expire, can that person be grandted citizenship? This person would technically have lived in the US on a valid green card for more than 5 years. I assuming this person kept getting 6 month extensions. Yes, I have a similar opinion. This is an interesting problem. I think that the law about citizenship does not know anything about temporary green cards… But probably they will find a reason why citizenship cannot be granted. Does anyone know more about it? What happens if the adjudication of the I-829 is delayed and the investor meets the residence requirements necessary to apply for the naturalization? Although there is a good argument under the statute and regulation that the investor is eligible to be naturalized, the USCIS position is that the investor is eligible to apply for naturalization but cannot be approved until the condition removal is approved. There is no circuit court opinion on this issue as of the date of publication of this article. The INA explicitly states that conditional permanent residents have the same rights and benefits as any other lawful permanent resident. 8 USC § 1186b(e). The plain language of this provision requires USCIS to count periods of time in conditional permanent resident status as satisfying the statutorily mandated five year residency time period for purposes of determining eligibility for naturalization. See 8 U.S.C. § 1427(a)(1). The regulations also state that “the rights, privileges, responsibilities and duties which apply to all other lawful permanent residents apply equally to conditional permanent residents, including but not limited to the right to apply for naturalization (if otherwise eligible).” 53 Fed. Reg. 30011, 30018 (final rule) (Aug. 10, 1988) (codified at 8 CFR §216.1); see also 59 Fed. Reg. 26587, 26590 (final rule) (May 23, 1994). Memorandum, Neufeld, Scialabba, Chang, “Conditional Permanent Residents and Naturalization under Section 319(b) of the Act, Revisions to Adjudicator’s Field Manual Chapter 25, AFM Update AD 09-28 (August 4, 2009). AILA InfoNet Doc. 09080761. Suzzane, Thanks for your good report, very complete. I have my receipt I-526 application on dec 9, 2015. I just note in IPO processing time page, that on September 30 they are processing files from dec 18, 2015. This means that my file is now under review, but, what can I expect about the approval date? I mean, once the file is being under review, how long time will take to deliver an answer? Got lots of answers. Thanks.If I apply from India for eb 5 visa this month. What kind of time frame should I expect for approval? Thanks.